On July 10, an open house will take place at Oakland City Hall to discuss a public transit expansion that could boost economic growth in the city’s Temescal, Uptown, downtown and Jack London districts. 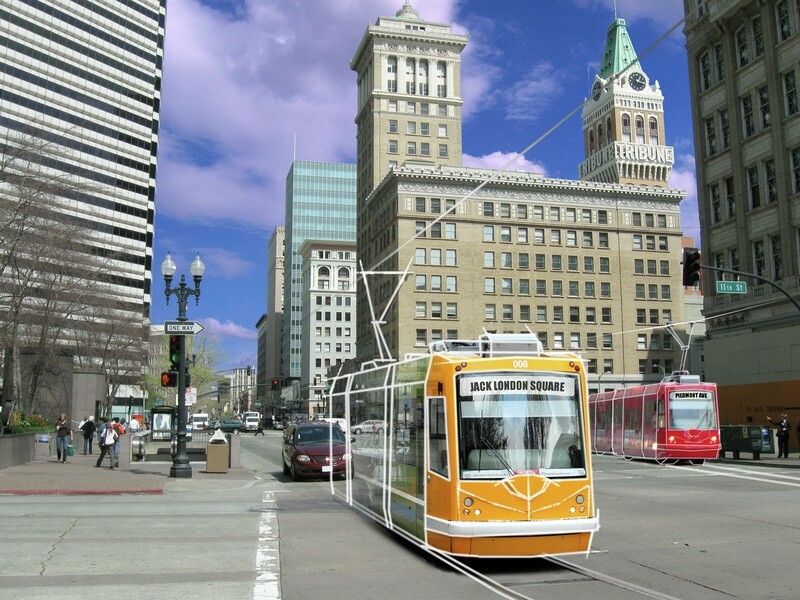 At the meeting, the City of Oakland will present the Broadway Transit Circulator Study, which evaluated the potential costs and benefits of electric streetcars and other enhanced bus services along the Broadway corridor. The Oakland City Council authorized the study in May 2013, approving $299,200 in Caltrans Urban Transit Grant funds and $30,000 in city economic development funds for the study. Led by consultant firm Fehr and Peers, the study includes Broadway from Jack London Square to the MacArthur BART station and 40th Street from Broadway to the MacArthur BART station. One of the primary goals of the study is to examine the feasibility of expanding the Broadway Shuttle to extend the route to Kaiser hospital and MacArthur BART, as well as the possibility of adding electric streetcars and rail systems. The Broadway Shuttle, a bus service that launched in 2010, is an interim project designed to gauge interest in potential streetcars or buses along Broadway. Commonly referred to as the “B Shuttle” or the “Free B,” it is a free bus service that runs from Jack London Square to Grand Avenue. According to a report published by the City of Oakland, the Broadway Shuttle services more than 14,500 passengers on a daily basis and has helped bring $8.8 million in purchases along its route. The Broadway Transit Circulator Study also aims to identify long-term funding resources for the shuttle, which is currently funded through public and private sources. In addition to expanding transit options along Broadway, the study and the potential project that could stem from it have several other goals, according to the City of Oakland’s website, including economic development along transit routes and improvement of social equity, environmental sustainability and public health. The potential project could connect BART, AC Transit, the SF Bay Ferry, and Capital Corridor/Amtrak, as well as connecting the downtown area and Jack London Square to other Oakland transit areas. The City of Oakland will hear from community members regarding the bus expansion during their open house on July 10, at 6 to 8 p.m. in Hearing Room III of City Hall. A second community meeting will be held in September (date to be announced); the completed report and final recommendation will be presented to the city council this winter. More information on the Broadway Transit Circulator Study can be found at www.oaklandnet.com/BroadwayTransit.